Hastings wasp nest removal Tel 01424 575048 : Treatment, eradication & control of Wasps and their & nests in Horsham, Billingshurst, Dorking Crawley & the surrounding area: Please call NMT Wasp nest removal on Horsham Rh12, 01403 390074. - Welcome to NMT Pest Control. We control bed bugs, moths, wasps, mice, mouse proofing, cockroaches, ants, flies, spiders and other unwelcome visitors. Welcome to NMT Pest Control. I cover Hastings, St Leonards on Sea, Battle, Bexhill and the surrounding areas. Destroying Wasps nests in Hastings & St Leonards. I treat wasps nests using a dust called Ficam D. This is applied using an extendable pole called a dust stick. The dust (containing a small amount of the insecticide bendiocarb) is blasted directly into the nest where it kills the wasps over a 24 hour period. All treatments are 100% guaranteed. This means that in the vary rare occasions that i'm not successful, I'll re-treat the Wasp nest at no extra cost. I'm trained to BPCA/RSPH level 2 certificate standards, am fully insured to a value of £5.000.000 and use a discreet, non sign written pest control van. NMT Pest Control offer wasp nest exterminating treatments to residential and business customers in and around Hastings & St Leonards in East Sussex. We kill 99% of wasp nests on the first treatment and charge a flat fee of £45.00inc for the first wasps nest, then £10.00 per wasps nest after that. As a result, no unpleasant surcharges when we show up at your property or place of work. All work is guaranteed, we will exterminate all wasps or come back to re-treat as many times as necessary. For Residential and business oriented wasp nest removal and wasp nest treatment service in Horsham. We treat wasps in all varieties of properties, regardless of whether you have a wasp nest in your loft, your shed or in your back garden, NMT Wasp nest control can take care of your difficulty. We provide a same day service with no extra change for weekends or bank holidays. 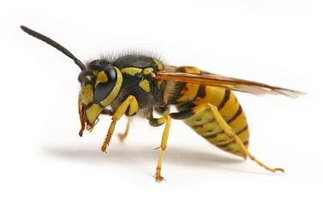 Wasps stings can be dangerous, and Wasps can become aggressive when disturbed. Wasps are abundant during late summer as their necessity for sugary foods increase. If bothered, wasps attack in numbers and can sting more than once (unlike a bee), so we never recommend you treat a nest yourself. Wasps stings pose an immediate risk due to anaphylaxis (an allergic reaction to the venom). It is thought that approximately half a million people in the UK have had an anaphylactic reaction to venom (bee or wasp stings) and it is estimated that there are between 1 and 3 cases of anaphylaxis in every 10 000 people, every year in the UK. If you discover a wasp nest in Hastings, St Leonards on Sea or the surrounding area, call Neil at NMT pest control on 01424 575048 today! We are also specialists in the erradication and control of clothes & carpet Moths, Flea infestations, Bed bugs, Mice, Cluster flies, Spiders & More!